The troops discovered a make shift night market at Boboshe village set up by the insurgents with newly harvested farm produce on display for sale. A solution to whatever that bites is to chop off its head, says an African proverb. For the Nigerian Army, part of completely decimating cut throat terrorists, Boko Haram, is to cut off its food supplies. On Saturday the Nigerian Army said its troops destroyed a Boko Haram grain market at Boboshe village in Borno State. 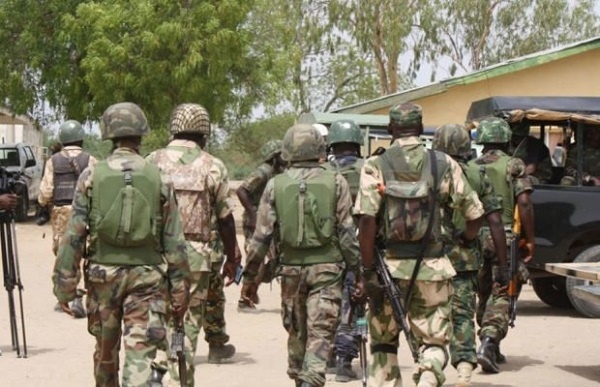 A spokesman for the Army, Sani Usman, who disclosed this in a statement in Maiduguri, said the destruction of the market was part of efforts by the armed forces to degrade the remnants of the insurgents. Usman said that the troops discovered a make shift night market at Boboshe village set up by the insurgents with newly harvested farm produce on display for sale. He said the troops conducted clearance operations in 7 villages, rescued 5 persons and recovered 3 vehicles, 4 Dane guns, a dummy gun and mattresses. A statement that contained the information read: "Troops of 112 Task Force Battalion and Mobile Strike Teams of 22 Brigade of Operation LAFIYA DOLE in collaboration with members of the Civilian Joint Task Force (CJTF) on Friday, carried out clearance operations at Gawa, Bone, Kajeri I, Kajeri II, Kube, Dubula, Boboshe I and Boboshe II villages in Borno State. "During the operation, the gallant troops discovered that the terrorists had erected a make-shift night market at Boboshe village with newly harvested farm produce on display for sale. “After conducting a thorough search of the vicinity, the troops recovered three Isuzu vehicles, four Dane guns, one Dummy gun, suspected to be used for training of inducted Boko Haram terrorists and mattresses hidden under shrubs".